A month ahead of the first race of the year in Hockenheim (GER), BMW Motorsport is very well prepared for the 2017 DTM. 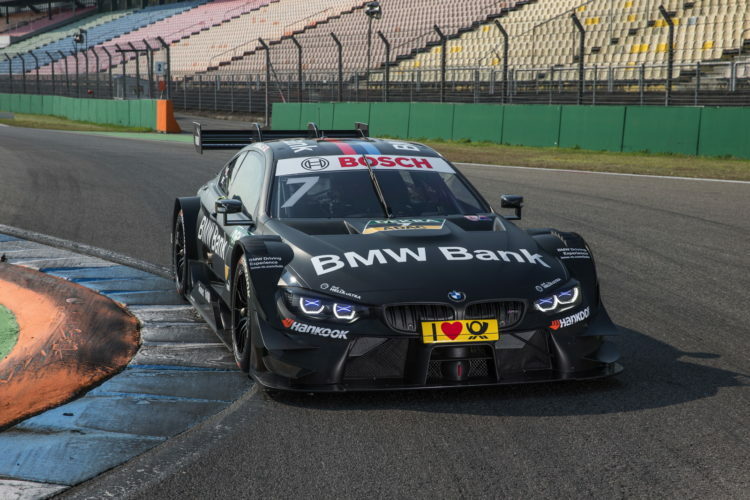 While the drivers and teams can call on a wealth of experience as they go into the sixth season since BMW’s return to the fiercely-competitive touring car series, the car is a newcomer: BMW Motorsport lines up this year with the BMW M4 DTM, which has been developed according to the new technical regulations. 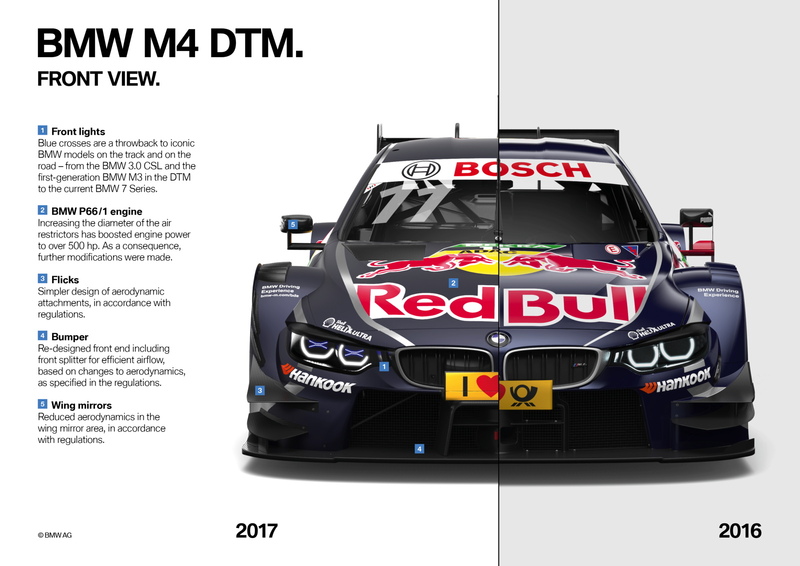 With four titles in three years: the vehicle designation BMW M4 DTM is synonymous with great success. 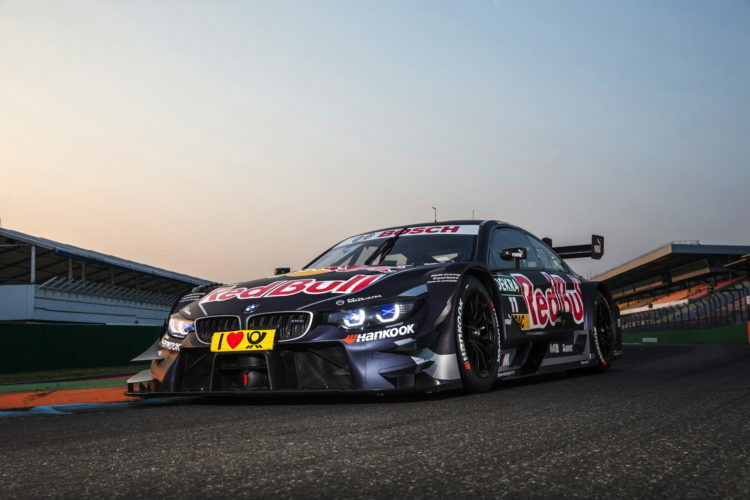 Marco Wittmann (GER) won the Drivers’ title with this car in both 2014 and 2016. BMW Team RMG also picked up the Teams’ title in 2014, while BMW won the Manufacturers’ Championship in 2015. This year sees the dawn of a new era. 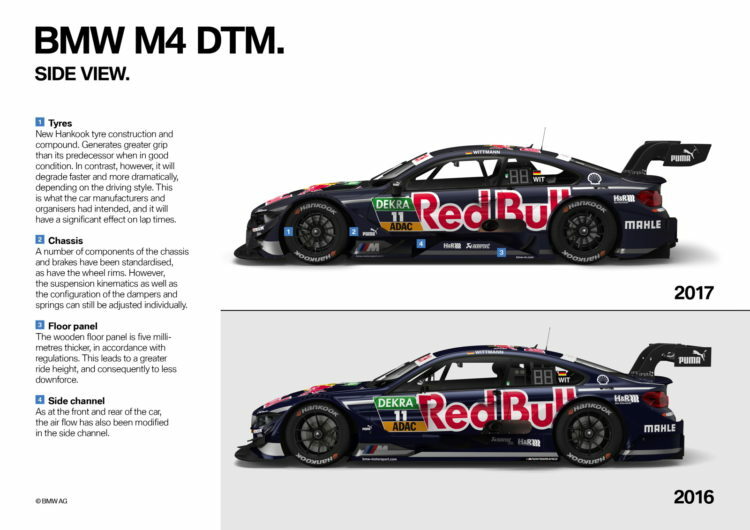 In the light of the new regulations, the BMW M4 DTM has been given a workover and undergone significant development. The BMW M4 DTM now generates over 500 hp of engine power, while the aerodynamics have also been the subject of extensive modifications. Innovative technology was used when manufacturing the components. Over the course of the aerodynamic development of the new BMW M4 DTM in the BMW Group’s Aero Lab, the engineers had to be even more efficient than usual: they had just 50 days in which to test the new model in the wind tunnel and to optimise it. As a result, CFD calculations, simulations and the rapid prototyping of components from wind tunnel models played a more significant role. When it comes to the engine, the DTM regulations for the 2017 season allow a larger diameter for the air restrictors, through which the engine draws in its combustion air. Having enlarged the air restrictors from 2 x 28 millimetres to 2 x 29 millimetres, the charge cycle was adapted accordingly. This increased the engine performance by about 25 hp to over 500 hp. Because the engine, now known as the P66/1, takes more cooling, due to the increased performance, the cooling air intakes towards the front of the car were also modified. As another consequence of the greater power, even more powerful and durable carbon-fibre brake disks are also used in the DTM in 2017. In its final spec, the BMW V8 engine consists of almost 800 different components. In total, the powerhouse is made up of almost 4,000 individual parts. 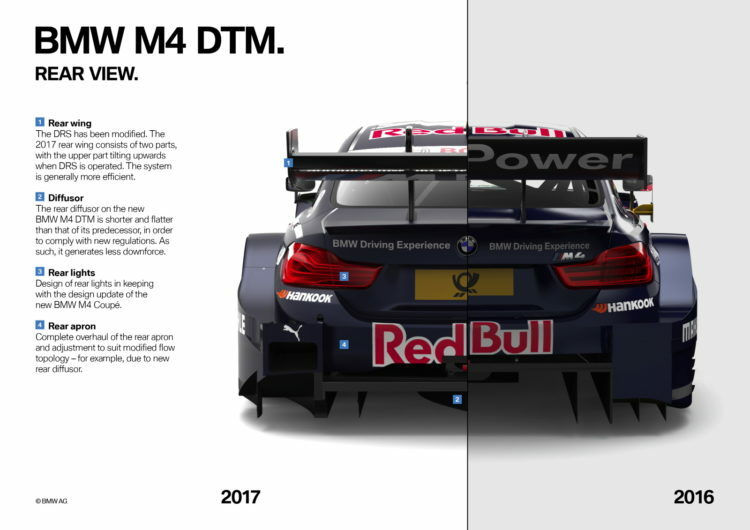 When designing the DTM power unit, BMW took full advantage of the technological know-how of the BMW Group. The high-tech foundry at the BMW plant in Landshut contributed the large castings, such as cylinder heads and crankcases. The processing of the castings, their coating, and any necessary thermal treatment, was performed by the appropriate specialist departments in Munich. BMW Power continues to be transferred to the track via a six-speed, sequential racing transmission, which is operated pneumatically via shift paddles on the steering wheel. It has eleven transmission ratios, which allow the engineers and drivers to react to the circuit and engine characteristics when setting-up the car. Innovative technology for even greater efficiency. The engine mount is a complex structural component, which is placed under great strain, and connects the engine frame to the engine. It was manufactured specifically for the DTM car using an additive 3D printing procedure and optimised using topology. BMW Motorsport engineers and their colleagues from BMW production development have been regarded as pioneers in the field of additive manufacturing for decades. Together, they are forging ahead with this future-oriented manufacturing technology, increasing both the efficiency and speed of the production of motorsport components. Since 2015, BMW Motorsport has used a water pump wheel made on a 3D printer in its DTM engines. The high-precision component, which is subject to high stresses, consists of an aluminium alloy and has proven its worth in the tough motorsport environment. 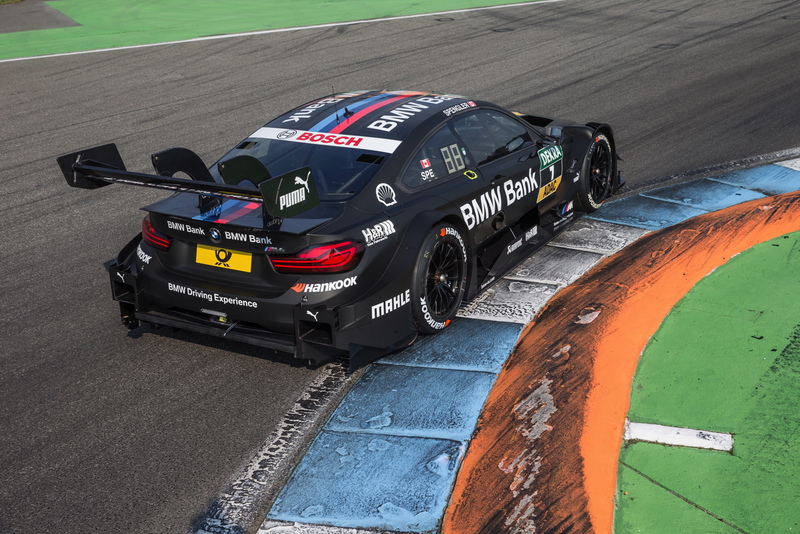 The carbon-fibre monocoque is again instrumental in ensuring the safety of the drivers in the new BMW M4 DTM. With an integrated tank, steel roll cage, and additional crash elements, it provides effective protection for the driver in case of an accident. New conditions, lap by lap. The interaction between the chassis and the 2017 generation of Hankook race tyre was also of great importance. With a new design and new compound, the DTM’s tyre partner is adding another exciting element to the coming season. The new dry tyre for the DTM – the Ventus Race – will generate greater grip than its predecessor when in good condition. In contrast, however, it will degrade faster and more dramatically, depending on the driving style. This is what the car manufacturers and organisers had intended, and it will have a significant effect on lap times. Finally, new, characteristic LED front lights round off the appearance of the 2017 model. They literally give the car a “dynamic look”. The rear lights have also been redesigned. 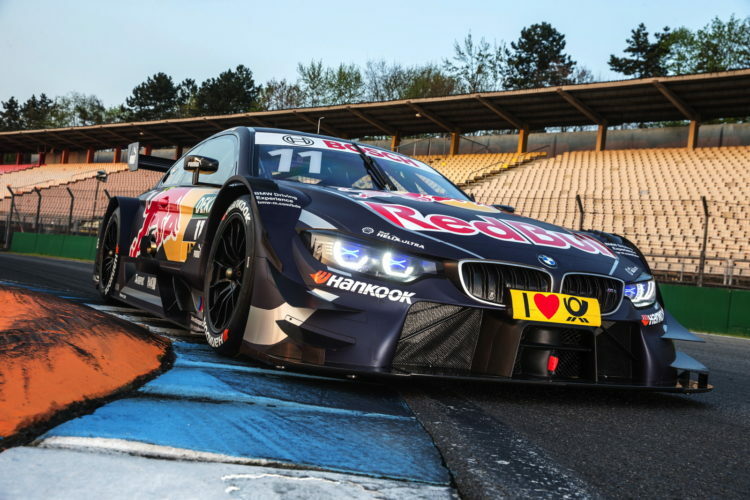 During the DTM tests in Hockenheim, DTM champion Marco Wittmann took time out to explain the most important modifications to his Red Bull BMW M4 DTM. [fvplayer src=”https://www.youtube.com/watch?v=oLqhf0lxeLw&feature=youtu.be” width=”640″ height=”360″]A compact look at the key modifications to the BMW M4 DTM. Front lights: Blue crosses are a throwback to iconic BMW models on the track and on the road – from the BMW 3.0 CSL and the first-generation BMW M3 in the DTM to the current BMW 7 Series. BMW P66 /1 engine: Increasing the diameter of the air restrictors has boosted engine power to over 500 hp. As a consequence, further modifications were made. Flicks: Simpler design of aerodynamic attachments, in accordance with regulations. Bumper: Re-designed front end including front splitter for efficient airflow, based on changes to aerodynamics, as specified in the regulations. Wing mirrors: Reduced aerodynamics in the wing mirror area, in accordance with regulations. Tyres: New Hankook tyre construction and compound. Generates greater grip than its predecessor when in good condition. In contrast, however, it will degrade faster and more dramatically, depending on the driving style. This is what the car manufacturers and organisers had intended, and it will have a significant effect on lap times. Chassis: A number of components of the chassis and brakes have been standardised, as have the wheel rims. However, the suspension kinematics as well as the configuration of the dampers and springs can still be adjusted individually. Floor panel: The wooden floor panel is five millimetres thicker, in accordance with regulations. This leads to a greater ride height, and consequently to less downforce. Side channel: As at the front and rear of the car, the air flow has also been modified in the side channel. Rear wing: The DRS has been modified. The 2017 rear wing consists of two parts, with the upper part tilting upwards when DRS is operated. The system is generally more efficient. than that of its predecessor, in order to comply with new regulations. As such, it generates less downforce. Rear lights: Design of rear lights in keeping with the design update of the new BMW M4 Coupé. Rear apron: Complete overhaul of the rear apron and adjustment to suit modified flow topology – for example, due to new rear diffusor. Technical Data BMW M4 DTM. Acceleration: 0-100 km/h in 2.6 sec.